Friday’s close at just shy of 1340 was purely a function of the way we got there and does not represent a breakdown of the similarities with 2007’s top. Am I as confident as that makes me sound? Ask me after Tuesday’s close. I’ve spent considerable time this weekend thinking long and hard about extra 10 points the market tacked on last week. Readers will recall I had a target of at least 1322, but left open the possibility of overshooting up to 1329 or higher. Four days into the rise, when the market had retraced 40.5% of its decline (comparable to 2007’s 48.7%), it should have done the Fibonacci shuffle for a 38.2% pause (34% in 2007). Instead, it retraced a whopping 77% of its rise, falling from 1298 to 1267. Not only did this give yours truly a nasty case of indigestion, but it made the whole rebound idea seem somewhat foolish. For us to reach our 1322 target by Friday, we’d have to gain 55 points in 5 days. Of course, we did it in 4 — reaching 1321.97 last Thursday. For anyone who’s ever cracked open a quart of Ben & Jerry’s when they’re famished, it’s easy to understand what happened next. The market hauled anchor, hoisted all sails and sailed right past the Point of Reason. 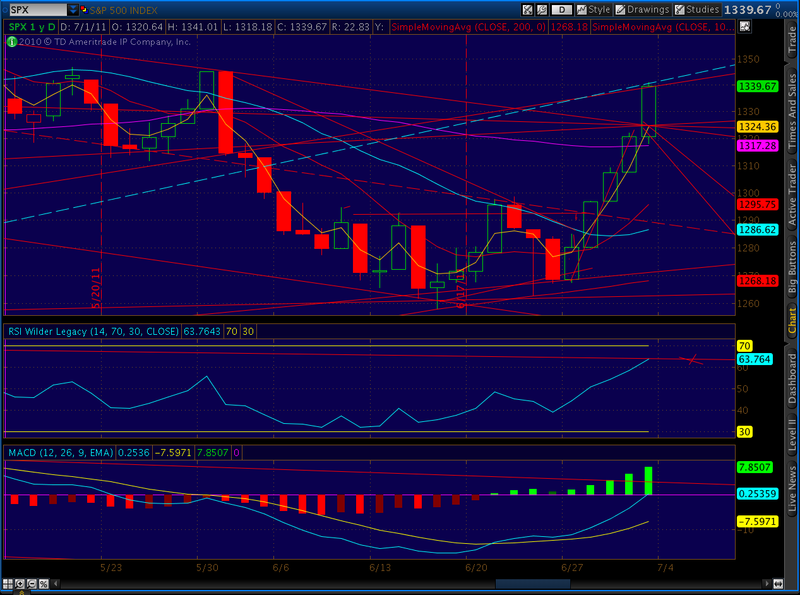 Should we have stopped at 1329? Sure, why not? But, that was 11 points ago. It’s time to stop living in the past. 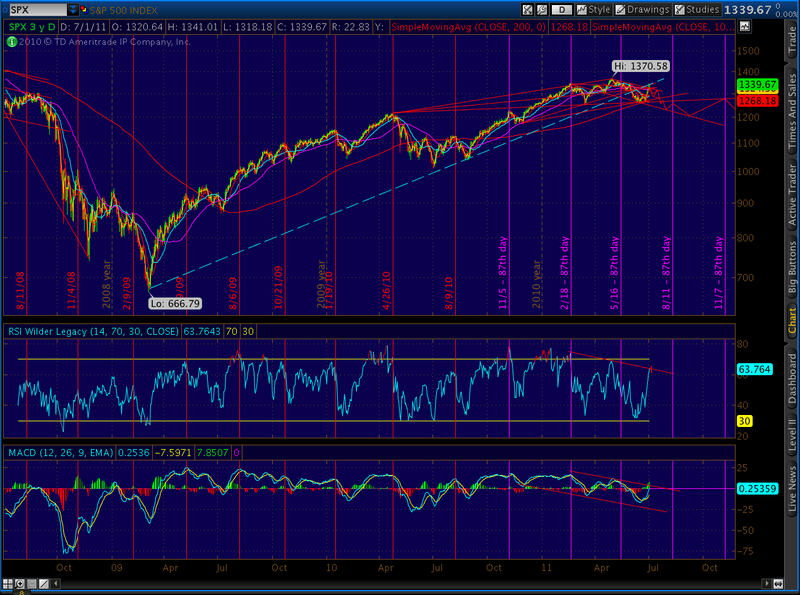 From here, I’m expecting a tumble to around 1299, possibly by the end of this week. It could go as low as 1286 in this first push, but I’m expecting the higher number simply because it provides the most ambiguity: the bulls could regard it as a corrective [iv] of 1 of wave 5 up. This market has seemed hell-bent on preserving ambiguity as long as possible whenever possible. I know, I know. It’s a short week, and everything points up. 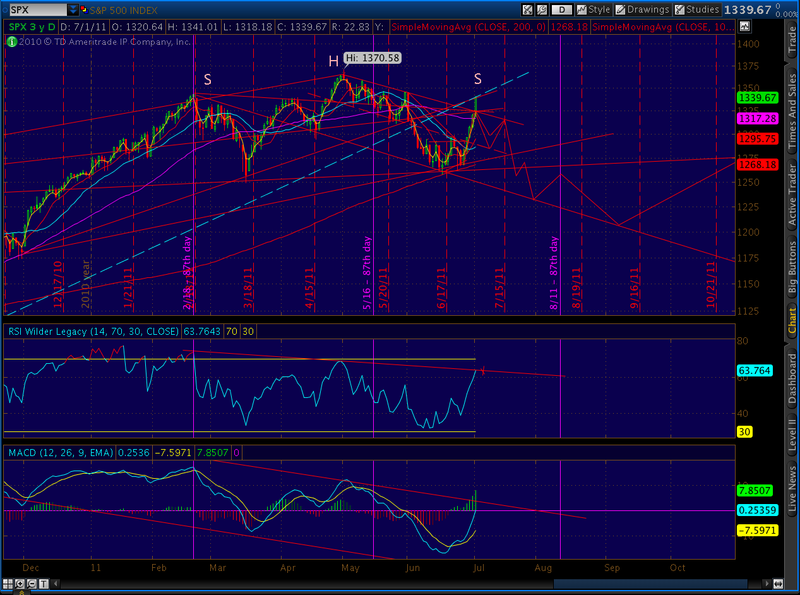 But, I didn’t listen to naysayers at 1298; what makes you think I’ll start now? 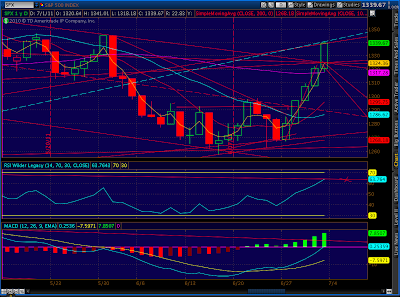 It’s entirely possible we start the morning up a few points, possibly kissing horizontal resistance at 1345. We could even have one relatively flat day as The Force and the Dark Side battle for control. But, we are heading down — and, soon. Last Friday’s move is analogous to 5/31, when we printed a big, fat 14-point gain — also above the 50-day moving average. That day, we also violated another downward sloping trendline off the May 2 high, and the bulls were out in the streets, beating their chests. The next day, June 1st, we were down 31 and didn’t stop until we’d lost 87 points. In the 2007 pattern, the market dropped 88 points in the five days following its equivalent of last Friday. So, don’t think it can’t happen. BTW, for those looking for more details, I redrew the fan lines off the March ’09 and August ’10 lows to eliminate the candle shadows. This allows us the extra 11-12 points we’ve already booked. Additional guidance includes the 78.6% Fib Line (off 1370 highs) at 1346.50 and that horizontal resistance at 1345.20 (double top, too.) In addition, we’ve reached the limit we established on the daily RSI a couple of weeks ago, and most of the technical indicators I watch on the hourly charts are overbought; many are already hooking down. 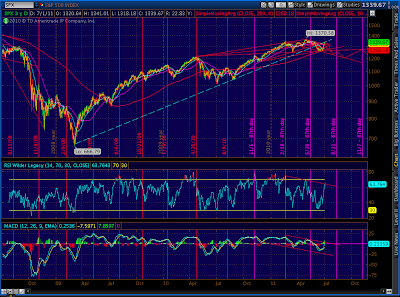 I continue to view the latest move up as a backtest to the fan line from the March ’09 lows. If things go according to plan, we’re tracing out a massive head and shoulders pattern with an objective target of 1146. 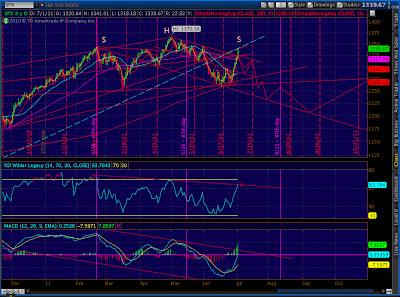 We should be down to 1220 inside of 6 weeks or so. I’ll leave the original forecasted market trend lines up just for grins. p.s. For anyone whose kids are bugging them to see the movie Monte Carlo, it’s cute — but not about statistical models, as my daughter had led me to believe. Just thought you should know.